One of my favorite things to do each summer is visit Farmers Markets. If you live in Iowa, there is a good chance that you have one close by. In fact, Iowa ranks second in the number of farmers markets per capita. While I love exploring some of the larger city farmers markets like Des Moines or Clear Lake, my favorite one to go to is my local Franklin County Farmers Market. 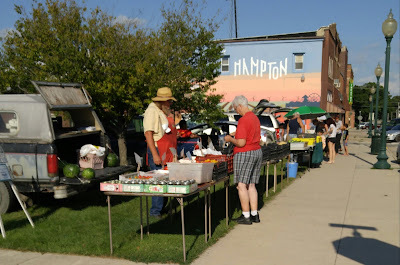 The Franklin County Farmers Market takes place every Tuesday and Friday from 5 to 7 p.m. from May through October at the Main Street Square in Hampton, located on the corner of 1st Avenue NW and 1st Street NW. There are up to ten different vendors at the market who sell products that range from fresh produce, baked goods, jams and jellies, honey and flowers and plants. August is one of my favorite times to travel to the Farmers Market because there is a large variety of vendors and produce available. But I love visiting all season long to support my community. Even though I plant my own garden, the Farmers Market offers a diverse collection of produce from what I grow at home and it always leaves me inspired. After visiting the Franklin County Farmers Market last week, I was inspired to come home and make a delicious breakfast with the variety of vegetables I bought. I don't know what it is about Farmers Markets but my first instinct is always to make something fresh and delicious for breakfast with my finds. In order to make these vegetables into a savory breakfast I decided to create a quiche. To start your quiche, you have to start with a good base, and by good base, I mean my recipe for lard crust! A lard crust is the best base for any type of pie or quiche! Then it's time for the filling! I decided what would really bring my egg-based filling up a notch, and add that creamy texture and richness I was looking for, would be to include AE Dairy's Heavy Whipping Cream. AE's Whipping Cream adds to the freshness of the dish, and helps makes the filling nice and smooth. Just like how my Farmers Market veggies were freshly picked that day by the vendors, in less than 24 hours, the raw milk at AE dairy is changed into any number of AE's product line and is on its way to your local grocery store. To top it off, my inner pig farmer had to shine, so I added a bacon lattice! Oh, yeah! Give me some BACON! Have I tempted you long enough? Prepare Pie Crust and place in pie plate or quiche pan. Bake at 350 degrees F for 10 minutes with foil or pie crust shield. Then press down crust and bake additional 2 minutes with no crust shield. While crust is baking, saute Zucchini slices with butter, salt and pepper. After crust is baked, place 7 slices of Zucchini evenly on the bottom of the pie crust. Mix Eggs and Whipping Cream. Stir in Onion, Tomatoes, Pepper, Garlic and Cheese to egg mixture. Pour filling into pie crust. Place the final 7 slices of Zucchini on top of the quiche. Bake quiche at 350 degrees F for 30 minutes. 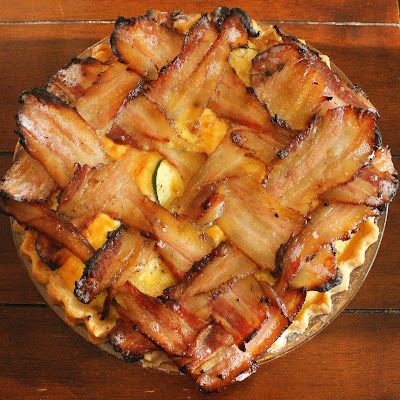 Take quiche out and assemble the Bacon lattice. Don't be afraid if the bacon lays over the sides of the quiche as it will shrink some in the baking. 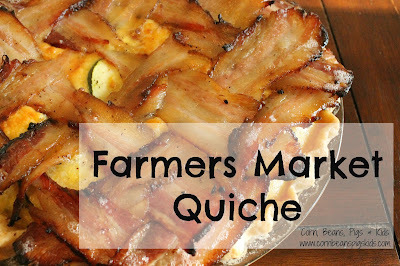 Place the quiche with bacon lattice back in the oven at 450 degrees F for an additional 15 minutes. Place a baking sheet under the pie plate or quiche pan to collect bacon grease. I love the layers of flavor in this quiche. The crust, the veggies, the eggs with whipping cream, and the bacon all blend so well, and at the same time give bursts of new flavors in each bite. I hope you get inspired by your local farmers market and make this quiche soon for breakfast (or dinner or supper...) soon! Have you attended a Farmers Market this year? What is you favorite thing to buy at the Farmers Market? What's your favorite way to use Whipping Cream? Remember to Comment for a Cause! Happy August 1st! 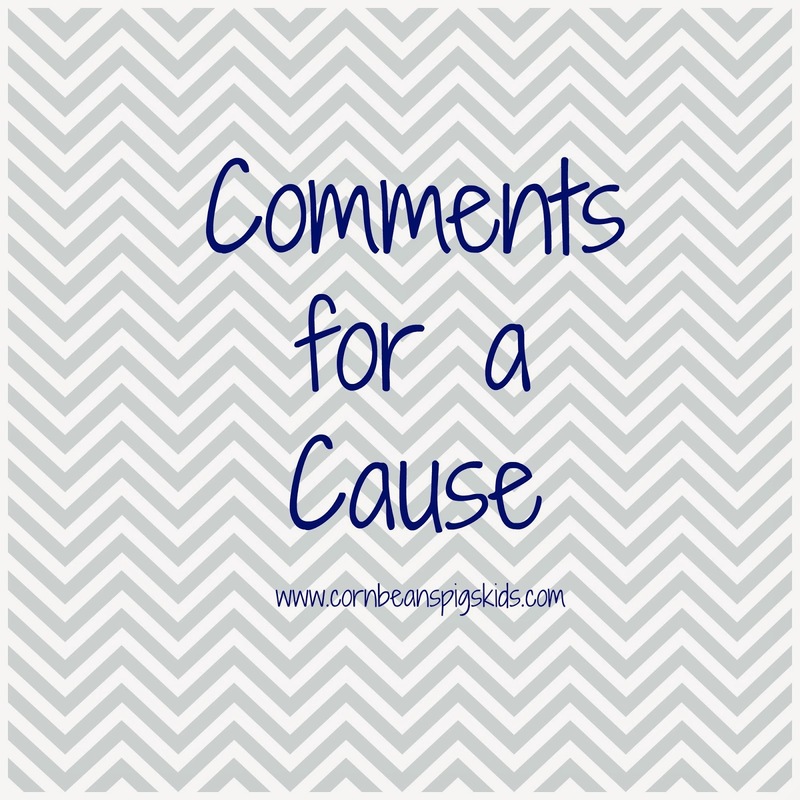 As a new month begins, so does the start of a new Comments for a Cause. Before we get into details about this month's cause, let's go through last month's numbers. 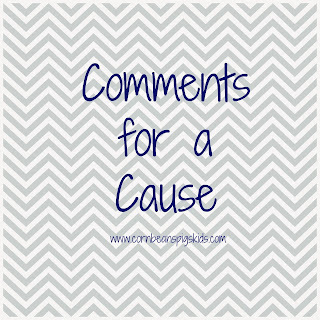 Throughout the month of July there were 64 comments on my blog, creating a $32 donation to KaBOOM! Thank you for helping me support this organization that works hard to support and inspire communities to "play." In the month of August I'm excited to be donating $0.50 for every comment made on my blog to Global Ministries's Family Village Farm. The first week of August is a busy one for our family because it is also Vacation Bible School week! 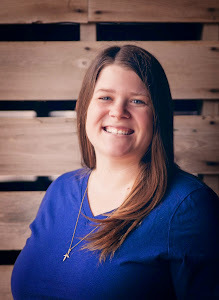 I have enjoyed being involved in our community's Vacation Bible School program the last several years and am this year's program's director. My favorite part of VBS is bringing together kids from multiple churches and towns to discover something new about Jesus and be inspired to help others. Each year's VBS has a strong mission component, and this year's "Journey to India" program is highlighting Global Ministries's Family Village Farm. Family Village Farm is a home and community for orphans and impoverished adults in Kasam, located in Southern India. Families are formed of ten to twelve children, a mother and grandparents living together in a cottage. There are usually around 150 to 200 children living at Family Village Farm, along with around 15 mothers and 15 grandparents. Creating these families gives the children and adults opportunities, housing and support. One opportunity for the resident children is that they're able to attend the school (elementary through high school program) located at Family Village Farm. The school and activities on the farm, help teach the children skills that will enable them to be self-supporting in the future. Along with the school located on Family Village Farm, there is a bakery, poultry farm, feed mixing unit and dairy. The young boys help with tending crops and fruit trees, and the young girls sew school uniforms and hospital linens to help support the Family Village Farm. 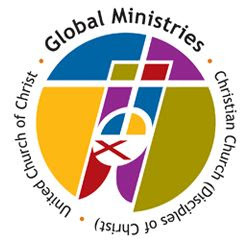 Support through Global Ministries goes to providing food, clothing, education and training for the children. Donations also assist with improvements and infrastructure needs such as restroom upgrades and buses to transport additional children and staff to the school. So help me continue the efforts of our community's VBS program and comment all month long to support Global Ministries's Family Village Farm. Did you help with your local VBS this year? What program did you do? Remember to Comment for a Cause! I know I say this pretty much every month, but how is it August 1st! July was a busy month for my family; between 4th of July, family vacation, county fair and my annual girl's weekend - the time flew by. August doesn't look like it's going to slow down either. We have VBS, State Fair, a family wedding and school starts. 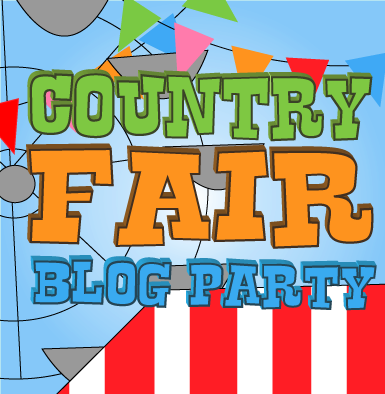 With so many things going on during the summer, the Country Fair Blog Party is a great way to share what you've experienced and how you like to enjoy your summertime. During last month's Blog Party, Best of Long Island and Central Florida's New York Push Cart Onion Sauce, was the most viewed post from the link-up! Congrats to Linda on getting the most clicks and receiving a Country Fair Blog Party Blue Ribbon! I have to admit, when I saw this post linked-up I clicked on it right away because I thought it'd be perfect to put on some of my homemade brat burgers. I love how the "sauce" has both onion and red pepper in it. This recipe is easy to whip up and a great topper to use this grilling season. The next Country Fair Blog Party Blue Ribbon goes to another recipe that'd be great for your next BBQ - Cooking with Carlee's Ultimate BLT Pasta Salad. My family and I are huge pasta salad fans. I bet I make a pasta salad each week during the summer. 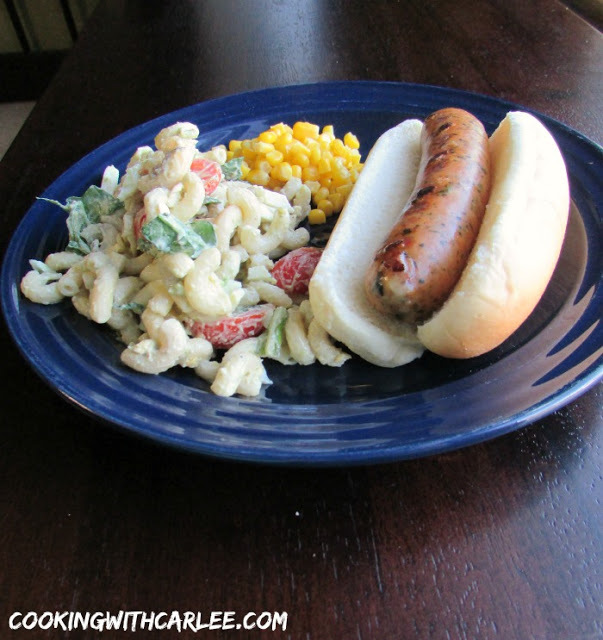 So when I saw Carlee's spin on Pasta Salad, I knew I had to make it. The recipe has the typical BLT ingredients in it, plus two ultimate ingredients, that make this a perfect summertime side dish. My final Country Fair Blog Party Blue Ribbon goes to Julie at Farming Grace Daily. Her post, "But what if I don't want to farm, Mom?" 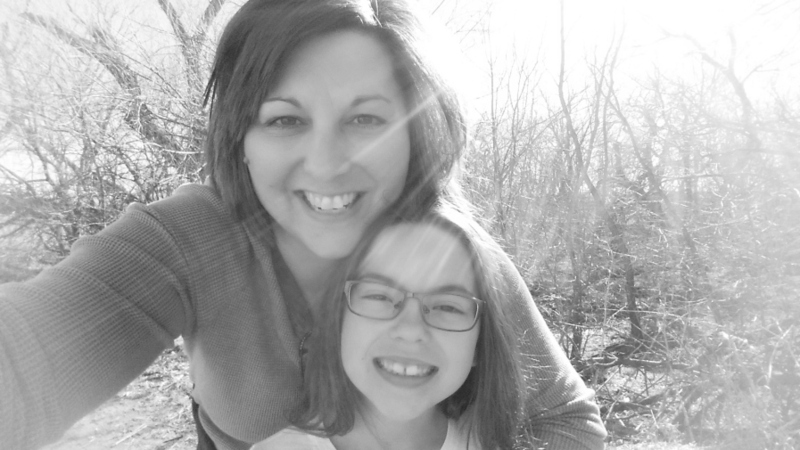 is a great parenting post for ALL Moms and Dads. My Farmer and I work hard so our kids have the opportunity to carry on our family's farming legacy, but at the same time - we aren't going to force it onto anyone. We will work hard to give them resources to succeed no matter what path they choose to go down. There is a reason why I tell everyone that I farm "corn, 'beans, pigs and KIDS" - because the most important "crop" I'm raising is our kids. Thanks to everyone that joined our blog hop last month, and I can't wait to see what great posts get linked up to this month's Country Fair Blog Party. Country Fairs are all about food, family, friends, farming, animals, arts and crafts, canning, baking and more. And that is what our our blog hop is all about too. Feel free to join our Country Fair by linking up to 3 of your posts. This blog hop is a great opportunity to check out new blogs, and if you blog yourself, have your posts reach a new audience. Be sure to visit some other party goers and let them know you are stopping by through the Country Fair Blog Party. We're excited to see everything you share this month! 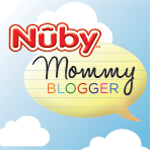 What is your favorite link from this month's Country Fair Blog Party? Whichever post is mentioned the most in the comments will receive my "Readers Choice" Blue Ribbon next month. Remember to Comments for a Cause!